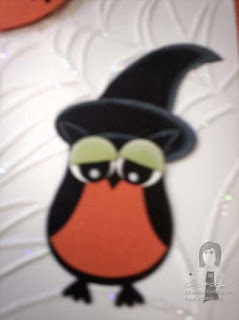 Rubber Room Ramblings: WITCHY HAPPY HALLOWEEN CARD WITH THE OWL PUNCH! 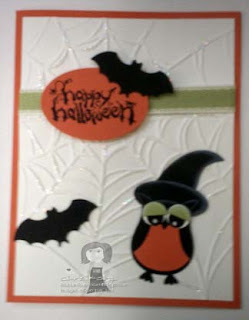 As promised on Tuesday, here is the Halloween card I made with the same sort of design as my 6x6 scrapbook page. 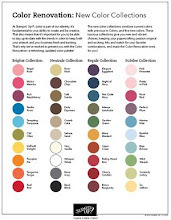 We'll be making this card at the Wright Club this month. They love their punches, so I'm sure they'll like this card~~atleast I hope they will. For the witch's hat I started off with the Stampin' Up! Wide Oval Punch. It gave me the "general" shape I wanted, and then I just cut it in a little bit at the middle and then sort of "winged it" for the rest of the hat shape. I did make a "template" for my customers to use so they wouldn't have to free-hand it. The bottom of the hat is just the small oval punch. I used the new spider web embossing folder from the Holiday Mini Catalog for the background. It's easier to see (I think) on the close up photo that I did put a little Dazzling Diamonds Glitter on the web.